Let's have a Provence wine tasting! Planning your wine tasting theme around a specific wine producing region is a great way to bring interest and fun to a wine tasting! By focusing on the wines from a specific region you can learn more about the specific styles of wines that are produced there. Rather than basing your tasting on a particular grape varietal, vintage or producer, you are basing your tasting theme on a whole wine producing region. Because there are literally hundreds of wine regions around the world you have a lot of options to choose from and a lot to learn! While a Provence wine tasting is as good a place to start as any, pick for yourself, or take a poll of your guests before your wine tasting party! How do you choose wines for a regional wine tasting such as a Provence Wine Tasting? Some regions produce only one general style of wine throughout that region. For example, most of Champagne produces only sparkling white and rosé wines from primarily Chardonnay and Pinot Noir. However, other regions produce several different types of wine in the same region. Examples of this are California (what don't they grow in California? ), the Loire Valley in France (a variety of wine styles and grapes are grown here, ranging from light, crisp white wines to heavy, rich reds, and everything in between), and even Bordeaux in France (while perhaps best known for their red wines, they also make white Bordeaux and even sweet white wines, known as Sauternes). One solution to this to focus on one specific region within these larger regions or on one style of wine from a given region. Alternatively, you could make it a free for all! Simply allow any wine from that whole region to get a good overall feel for the different styles of wines that are produced there. Just be sure to serve them in an order that makes sense. For example, for a Provence wine tasting, start with the light white wines, working up to the aromatic rosés and finish with the big, full-bodied reds. Either way is fine, it just depends on what you are in the mood for and what you want to learn about! Pair local foods and/or decor with your wines! While a bevy of related wines from a given region is enough of a reason to celebrate, pairing those wines with traditional foods from that region makes it all the better! This turns a regional theme such as a Provence wine tasting into an amazing dinner party. Most wine regions have classic local cuisines that grew up over the centuries with the wines. 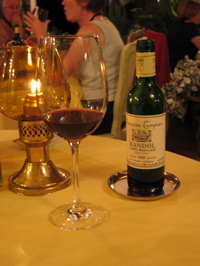 Therefore, those wines are often the absolute best wines to pair with those cuisines. Hundreds of years of experimentation can't lead you wrong can it? To add to the fun, try to decorate your table in the style of that country or region. If you don't know much about the cuisine in question, look online for some recipe ideas. For example, if you are having a Provence wine tasting, do a search for "Provence cuisine", "Provence recipes" or "Provencal cuisine". If that isn't enough and you are really enthusiastic to be authentic, find a book devoted to the cuisine in question. For a Provence wine region you will find many cookbooks! My favorite is "Lulu's Provencal Table" by Richard Olney! For many regions, like a Provence wine tasting, you will not have a hard time finding plenty of ideas. The areas you may get into trouble are the new world regions (like California or Australia for example) which don't have one wine and cuisine style which have grown up together. In those cases it may not be possible but get creative and find foods that pair well with the wines you are serving. Provence (France) - The beautiful south of France makes wines in several appellations, most notably Bandol and the southern Rhone appellations such as Chateauneuf-du-Pape and Gigondas. These wines have a wonderful, wild sauvage and rustic quality to them that makes a Provence wine tasting a lot of fun, especially when paired with Provençal styled cuisine. Bordeaux (France) - Structured reds based primarily on Cabernet Sauvignon and Merlot as well as whites and sweet wines based on Sauvignon Blanc and Semillon. Burgundy (France) - Seductive red wines from Pinot Noir and elegant whites from Chardonnay. Northern Rhone (France) - Regions like Côte-Rôtie, Hermitage, Crozes-Hermitage and St.-Joseph make rich and heady red wines based on the Syrah grape. White wines are primarily from the Marsanne grape. Loire Valley (France) - A whole host of different styles. Some white examples are Sancerre (Sauvignon blanc), Savennières (Chenin blanc), Vouvray (Chenin blanc), and Muscadet (Melon de Bourgogne). Some red examples include Chinon (Cabernet franc), Bourgeuil (Cabernet franc), and red Sancerre (Pinot noir). Alsace (France) - Another region where many types of wine are produced. Most are white and based on either the Riesling, Muscat, Pinot gris or Gewurztraminer grapes. Sauerkraut, pork and spicy mustard anyone? Champagne (France) - Regal sparkling white and rosé wines based on Chardonnay, Pinot noir and Pinot meuniere. Germany - Primarily off dry to sweet but racy and intense wines made from Riesling although a fair amount of other grapes like Schreurebe are produced. These wines can be amazing with traditional German foods but also pair surprisingly well with spicy Thai dishes! Who would have guessed? Piedmont (Italy) - Big, structured and elegant wines in Barolo and Barbaresco made from the Nebbiolo grape, fruity and chewy wines from the Barbera grape, and lighter, fruity food wines from Dolcetto. Tuscany (Italy) - Traditional reds from Sangiovese such as Chianti Classico and Brunello di Montalcino as well as newer "Super Tuscan" blends of various grapes such as Cabernet Sauvignon, Merlot, Sangiovese and others. Rioja (Spain) - Passionate blends of red varietals usually centered around Tempranillo. Portugal - Both dry red wines as well as rich, sweet fortified wines called Port. Madeira - This little island off the coast of Portugal in the Atlantic Ocean produces a unique fortified wine called Madeira, ranging from dry to very sweet. Sonoma, Napa, Central Coast, Russian River Valley (California) - California produces a huge range of different wines from different grapes and in different styles. To really make a regional tasting out of California you might want to limit it to one of the smaller regions within the state, such as the Russian River Valley. Even better, limit it to a particular grape varietal within a region such as Pinot noirs from the Russian River Valley to keep it focused! Oregon - Known for their excellent Pinot noirs, although other grapes are produced as well. Australia - A range of wine grapes and styles, but particularly known for their powerful wines made from the Shiraz grape, which is the same grape as Syrah from the northern Rhone valley in France. New Zealand - A newer wine producing region, they have become known for producing dry, intense whites, particularly from the Sauvignon blanc grape. Done reading about the Provence Wine Tasting Theme?